How can I get a quote on pricing? The best way to get an accurate price range is through a consultation with an artist, if not in person, through the tattoo request form. In order for us to quote your idea, we take into consideration the subject of the tattoo, the placement on the body, the size, detail, etc. It’s practically impossible for us to give you a quote over the phone without having all of this information. We do have a $50.00 shop minimum, but please contact us to discuss details. You are also more than welcome to come in to Downtown Tattoos and talk to one of our shop managers or artists who would be more than happy to help get you the information you need! The State of Louisiana requires a valid form of identification from anyone getting tattooed by a licensed professional tattooer, proving you are at least 18 years of age. There are no exceptions to this, and in order to get tattooed at Downtown Tattoos you’ll have to provide an ID. For appointments, we do all of our booking in person over the telephone. All appointments made require a $50.00 non-refundable deposit, all $50.00 will go towards your new tattoo. When is Downtown Tattoo open? Downtown Tattoos is open to the public for walk-ins and appointments from noon to 10PM Tuesday thru Thursday and noon till midnight Friday thru Monday. Where is Downtown Tattoo located? We accept cash or credit (Visa, Mastercard, Discover, and American Express), as well as our awesome gift certificates! No checks, please. Do you guys sell t-shirts or merch? Tattoos can get a bit uncomfortable at times; however, we do sell a topical numbing cream at the shop that you will need to apply 2 hours before you get tattooed. How does the jewel sparkle? Our Crystal teeth jewels are glass crystals, made in Germany. Their flat back is surfaced with a special coating to create a sparkle and shine like a diamond. How long will the tooth jewel last? A Tooth jewel applied according to our instructions on a natural tooth will stay on until you decide to have it removed again. Based on our experience it will certainly stay on for 6 months up to a few years. Can I feel the DecoDent jewel on my tooth? DecoDent jewels are only 0.4mm or 0.9mm thick and 1.8mm to 3mm in diameter. Initially something on your tooth will feel different, but a few days after the application you will get used to the new feeling. Will the jewel harm my tooth? No! The jewel is bonded to the enamel like a orthodontic bracket or a filling to your front tooth, without any drilling or pain. The procedure and removal can be compared to the placement and removal of orthodontic brackets. When it is removed it it simply popped off and the tooth will be polished to remove any remaining bonding material. Does the jewel impede brushing? No, the presence of the gem will not make any difference regarding dental hygiene. However, it is recommended not to use an electric tooth brush for the first 24 hours after the jewel has been attached. What if the jewel falls off and I swallow it? The jewels are tiny glass crystals or gold. They have no sharp edges. It will basically come out “the natural way” the same as it went inside your body. We offer a 2 week guarantee if it falls of we will replace it. That is not the case with any of our special order gems. Can I still have my teeth cleaned by my dentist/hygienist? Yes, you can and should still have your teeth cleaned by a professional. DecoDent jewelry will not cause a problem for the hygienist cleaning your teeth. The area underneath the jewel is sealed like a filling and will not let in any bacteria. The hygienist can easily polish on top and around the jewel with a soft point. They are 50.00 for one and 30.00 for each additional one. All special orders are priced separately. All of our staff that apply the TOOTH GEMS are all trained and certified. Please e-mail us at downtowntattoos@gmail.com if you have any more questions. What equipment do you use & is it safe? All equipment used during piercing procedures is autoclave sterilized and/or hospital grade disinfected. How old do you have to be to get pierced? A release must be signed prior to receiving your piercing. Government issued ID stating that you are 18+ is required for all piercings. 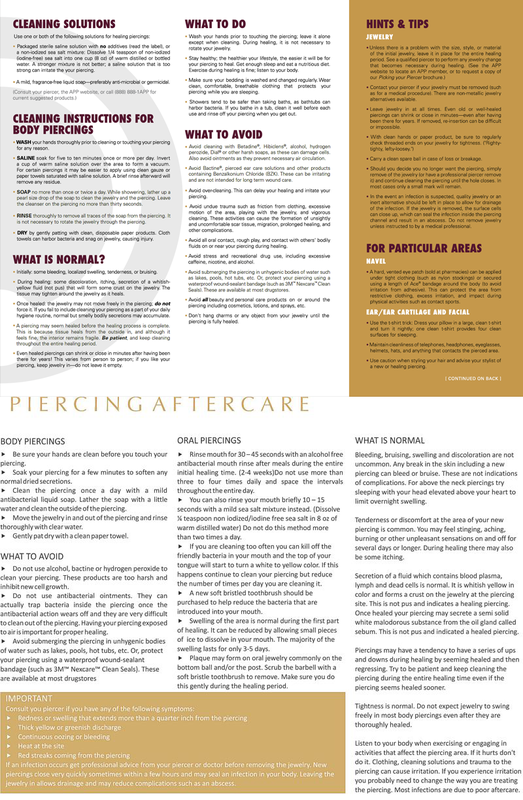 After you get your piercing you will be given care instructions on how to care for you new piercing. We also sell Saline solution to care for your new piercings.